Industries proliferated throughout the borough in proximity to the rail lines, often behind residences and commercial buildings. Those surviving in the historic district (less than 1 percent of contributing buildings) are situated adjacent to rail lines. All are utilitarian in design and lack any architectural style. The 1848 Hegarty Blacksmith Shop is located on Lafayette Street at the hillside juncture of Hegarty Avenue and Nescopec Street. It is single-story, board and batten construction with metal roof. The 1865 Conrad Bischoff Planing Mill and Furniture Factory (320 Lafayette Street) sits amid a residential neighborhood and is the earliest industrial building surviving in the historic district. It is a 3-story, brick Victorian, with shed and barn at the rear fronting Rowe Street and the abandoned Mountain Link Railroad right-of-way. The 1875 Tamaqua Shoe Factory (now part of Aiken Lumber) is a prominent complex at 401 Hazle and Patterson Streets and includes later poured concrete buildings to accommodate later use as a dairy. The 1897 Jonah McGinty Brewery is a Romanesque Revival example fronting East Broad Street near the 500 block rail crossing. Across the street, c. 1910 the Sprite Shirt Factory at 420 East Broad Street is a large frame building sitting on the Reading Blue Mountain & Northern rail spur. The c. 1910 Tamaqua Manufacturing Company buildings (later the Panther Creek Packing Company) are set back from East Broad Street behind East End Avenue along the same rail line. The buildings are poured concrete with metal windows and parapet roofs. Remaly Manufacturing (205-211 Cedar Street) is housed in a c. 1920 building including a staging area, manufacturing building and offices. 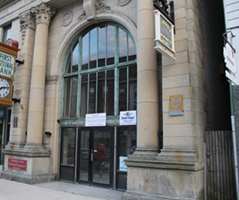 Remaly Manufacturing is located in a mixed-use block adjacent to auto repair shops and residences. Former East Penn Electric Company sub-station buildings --2-story brick buildings now owned by the borough -- are located on the same line at South Greenwood Street. 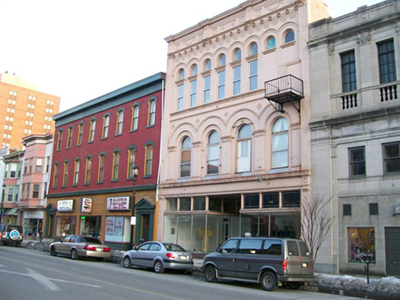 Other architectural resources in the Tamaqua Historic District serve a variety of functions. 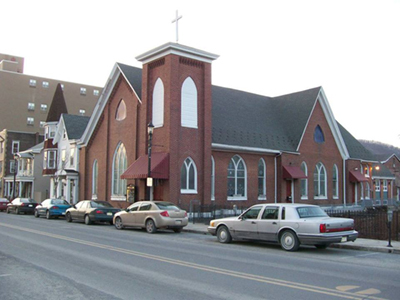 Eight churches span the entire era of Tamaqua’s development, several replaced earlier churches. The 1851 Calvary Episcopal (300 W. Broad Street) of cut stone with raised entrance and center tower is earliest. The 1852 First Methodist Church (122 West Broad Street) is a rare example of the Greek Revival, again with central entry, and a 25-foot-tall bell tower. Other mid-19th century churches are the 1856 brick St. Jerome’s Roman Catholic (260 West Broad Street) and the 1857 stucco-finished First Presbyterian ( 230 West Broad Street), both Gothic Revival. Late 19th century examples are the c. 1880 First Lutheran (a frame Victorian with little detail at 231 Mauch Chunk Street, now vacant, most recently the Italian Club) and the Victorian Gothic St. John’s Evangelical Lutheran at 200 Mauch Chunk and Pine Streets, built by contractors Becker and Shilbe in 1895. Early 20th century churches in the district are Bethany Evangelical Congregational Church, a brick Gothic Revival with 3 lancet windows at the 223 East Broad Street (adjacent to the Panther Creek) and the 1927 Zion Lutheran Church at 101 North Greenwood, High Gothic, of granite with white stone and wood trim with matching parsonage. Three early twentieth century school buildings survive. The St. Jerome’s Regional Catholic School (250 West Broad Street) is active today in its original 1919 Gothic Revival structure. Two others -- the former Arlington Street School (548 Arlington Street, a c. 1920 yellow brick Colonial Revival) and the Rahn Township School (753 Arlington Street, a narrow clapboard minimal simple Free Classic with two cross gables, c. 1900, incorporated into the borough with the 1972 merger with Rahn Township) -- have been renovated for apartment and single family dwelling use, respectively. Four borough fire companies are found within the district. The oldest surviving structure is the c. 1881 brick and terra cotta American Hose Company at 41 Mauch Chunk Street, incorporating grand arched windows and ornamental belt courses. 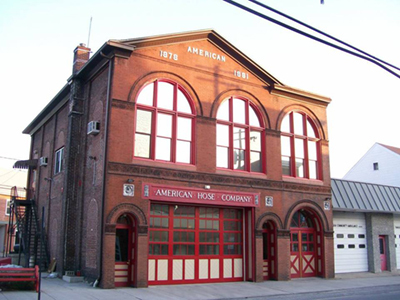 The borough’s oldest fire company -- in its second home -- is the Citizen’s Fire Company No. 1. This neighborhood fire company building (51 West Rowe Street) was constructed in 1914 by contractor Graeff of yellow brick with projecting second-story bays on a triangular lot with attached Borough Hall and police lock-up (both now vacant). Its second floor later incorporated the Tamaqua Lyceum library. The South Ward Fire Company (1916, Vangelder Street at South Swatara Street) is a nondescript brick building. The borough’s last fire company, the East End Fire Co. was constructed c. 1923 with a shallow Mansard roof at 555 East Broad Street. The Post Office (399 East Broad Street) is a 1932 yellow brick and stone Neoclassic Revival example 7 bays wide in the enframed block form. It has a stone foundation, colossal entry porch, cast iron entry lights, iron entry grills and granite entry steps. Borough government is housed today in the former Tamaqua Armory (320 East Broad), a 3-bay brick late Gothic Revival example with crenelated roof line and tower. Its front section remains administrative offices while the rear drill hall today houses the borough council chambers. 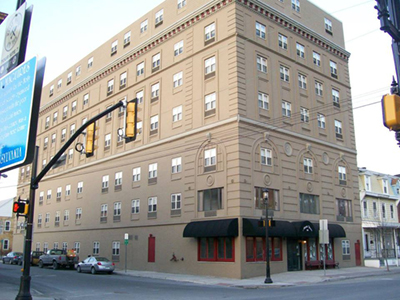 Recreation and cultural buildings include the previously mentioned Neoclassic Revival Majestic Theater and Hotel, now apartments, at 201 East Broad and the c. 1930 Bowl-O-Drome at 231 West Rowe Street, commercial style, brick with glass block. Social clubs are numerous: the L.O.O.M. (13 East Broad Street) a c. 1900 Classical Revival 3-story with pilastered first floor, the Colonial Revival Elks Club and the Masonic Hall discussed above, and the American Legion, housed in a c. 1860 Victorian Gothic Cottage at 206 West Broad Street.